What ho! I think it's about time that someone spoke up for a disgracefully under-represented group in this country. If we look at the last decade or so, everyone has been bombarded by banks with invitations to borrow huge sums regardless of the capacity to pay or the adequacy of security. It is hardly surprising therefore that an large number of new borowers found this debt unsustainable. To compound the problem this junk debt was bundled together and securitised and sold into a market which ultimately was built on worse foundations than just before the Crash of 1929. Inevitably the worst happened causing a global financial crisis which nearly saw the collapse of the banking system of the whole world. As in 1929 a recession if not depression has ensued with economic downturn, massive unemployment and initial deflation. Where does that leave everyone? 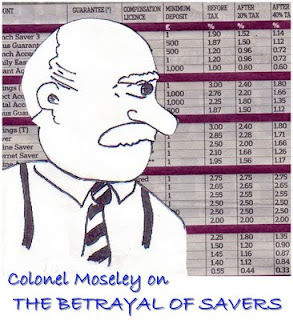 Well.. the borrowers and bankers who caused the problem appear no worse off. The bankers seem to have returned to a bonus culture remarkably quickly and only time will tell if more prudent lending policies will now prevail. Existing borrowers never seem to have had it so good with interest rates at pretty much an all time low. Many have had their cake and eaten it: a clever trick. The worst off seem to be the unemployed who lost their job with the recession and small businesses unable to sustain normal levels of working capital on overdraft from myopic and jittery banks. Hard hit too are the retired, many of whom have saved all their working lives and abstained from extravagance or borrowing. They have done this to build up a nest egg so that interest will supplement such pensions as they have to give the dignity of self-sufficiency into retirement. Hardly any consideration seems to have been given to the huge impact of reductions in interest rates upon this class of person who is the very backbone of this country. A small and entirely cosmetic increase in the permitted investment in Isa's is all that seems to have been done to recognise the issue. As demonstrated by his attacks on private pension provision, Mr Brown seems to have some kind of grudge against the person who works hard, saves, does not take on excess debt, pays taxes, obeys the law and tries not to rely upon hand-outs from the state. The interests of this type of valuable citizen have typically been shamefully ignored. What ho! Having returned to the fray, I feel better for having expressed my dismay over our MP's expenses. If the phrase that keeps springing to mind in relation to our ruling class nowadays is "They just don't get it, do they? ", the word that crops up increasingly in daily life is "anxiety." I can imagine someone reading this saying "What is he talking about?" and comparing the comforts of 2009 with the last war and the fear of living through the height of the Blitz or the worry of having close ones on military service or otherwise in constant danger. I'm not minimising those instances, it's just that today the imposition of constant, unkind and unnecessary fear and worry on ordinary hardworking people seems to be increasingly the norm. It's an insidious trend and particularly affects many of those least able to cope with it - the elderly, the lonely, the disadvantaged and those retired on fixed incomes. What's more, this pressurising, which is a kind of bullying -comes from those who should know better - large companies, utilities, banks, local authorities and bodies which seem to have forgotten they are there to serve the people of this country. Credit and debit cards: many of us were quite happy to use cash or cheques for most transactions. As a gesture towards modernity we then went so far as to use debit cards for payments. Money went straight out of one's bank account. One still didn't have to have an overdraft and could use a cash balance and no borrowing was involved. The Masters of the Universe at our banks then decreed that we had to have chip and pin and that this would make things much more secure. In reality with cloning and copying devices in use at cashpoints and swipe machines or whatever they are called things are much worse. Any trip to an unknown pub, restaurant,shop or garage seems now to involve a very real risk that one's card details will be appropriated and used to deduct cash in India, Australia, Russia or Canada. The first one knows is often a 'phone call from the bank asking "Are you in downtown Mumbai?" or the appearance of large unauthorised cash withdrawals on one's bank statement. As yet, the banks are reasonably quick in refunding the stolen money, but one wonders how long this will last. There are already signs that more of an onus is being put upon the victim to prove the theft rather than a presumption of innocence. In consequence I use my debit card less and less. I never ever use it to buy petrol at the garage or in pubs, restaurants or shops I do not know well. I only ever use it on secure websites and then only those of repute such as Amazon. Every use of a debit and credit card now brings an unnecessary worry. Utilities: in the last few years the price of gas electricity and petrol had risen exponentially, A good part of this increase has been unfair and caused by the multi-national oil companies or market manipulation by speculators that our rulers are too lazy, stupid or unduly influenced by those with vested interests to prevent. We are forced to pay for various services by direct debit and billing seems to have become a lottery for the consumer - a perverse lottery with no prizes, only penalties. Bank statements : in consequence of the criminal misuse of the insecure chip and pin system and profiteering by utilities the arrival of each bank statement is now an anxious process. It is almost a surprise when one's account has not been pilfered or a charge for gas, electricity is not double what one budgeted. Unfairly increased bank charges are also making the experience much worse. Instead of being straightforward routine the opening of every statement is now a worry. Moving supplier: dealings with large companies in telecoms, utilities or retail are increasingly stressful and upsetting. Many seek to tie up their customers in increasingly complex and penal deals with lengthy or expensive termination terms so that it is awkward and costly to extract oneself and move to another provider. It is also frustrating and time-consuming to speak on the telephone to most suppliers with queuing, automated systems and unhelpful staff making the whole process irritating and often confusing. It is as if they really don't care how appalling the experience is for the customer and how much anxiety they create. Call centres: it is very difficult to speak to a local branch of a bank or building society about one's account. It is impossible to have anything but a depersonalised call to call centre when dealing with a telecoms or utility provider. Naturally all government departments are depersonalised and formulaic in their dealings on the telephone. Most take a good deal of time. They inform you every time that the line is busy and then lead you through a sequence of menus, options and warnings about recording for training purposes until the final queue is reached which may involve you in sitting there for ten minutes to an hour. When you ultimately speak to a person you are often transferred and if you have the temerity to ask a question that they are not fully briefed to answer there is no chance of a meaningful reply. This experience is irritating and demeaning. It indicates plainly the extent to which the companies in question do not have the slightest concern for the shear dreadfulness of the experience of their customers in dealing with them. The experience of the customer is negative and anxious and it is wholly unnecessary . Hospitals: I still strongly believe in many aspects of our welfare system including the National Health service. However, given direct observation of the experience of those closest to me -not just hearsay or gossip - I am very anxious at the thought of hospitalisation today. I am worried about the ongoing risk of picking up infection such as MRSA or C Difficile. I am worried about the embarrassment of mixed wards. I am anxious about lack of security and personal safety. 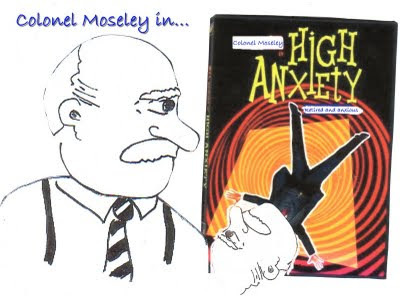 No-one going into hospital should have any of this anxiety. Refuse collection: I know I have a bee in my bonnet on this issue, but why do they have to make it so difficult? If the elderly or inefficient make an honest error in for example wrapping potato peelings in a sheet of newspaper and putting it in the organic waste bin, why is the whole bin rejected and left un-emptied and a fine threatened to be levied? Why is it necessary to make the life of the ordinary householder so hard and to impose such unnecessary worry? So there you have six or so examples. It's basically about ordinary people without power being bullied and made anxious by those who can - large companies, utilities, banks, local authorities, hospitals and "our" government. The point is that many of the the bodies with whom the ordinary person had to deal nowadays are too large and too impersonal. They have lost sight of the need to give a damn how the customer feels. The customer, patient, ratepayer or whoever suffers more pain and anxiety in consequence and is increasingly bullied. Isn't it time to understand this and do something to stop it? 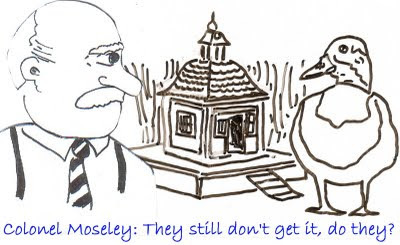 Colonel Moseley: They still don't get it, do they? What ho! After a lay-off of several months, I thought it was about time to return and cast a critical eye over recent events. I don't mean to carp, but don't say I didn't warn you. You turn your back for a while and what happens? We have seen the worst financial crisis since 1929 and a recession that resembles the beginning of the Depression of the 1930's. In addition, we have a political system in the UK mired in an expenses scandal that has removed whatever lingering respect the citizens of this country had in their ruling class. On top of this, we have accelerating global warming producing climatic extremes that our governments do not say much about and a global pandemic of swine 'flu which may or may not mutate into something much more dangerous in the autumn, as Spanish 'flu did in 1919. Good times or what? Nowadays all problems are referred to as "global" and thus no-one is to blame - a perpetual reusable "Get out of jail free card." The recent expose regarding the extravagant claims for expenses by some of our MPs showed a lot of things. It is obvious that in the past the powers-that-be compensated MPs for the failure to grant them larger increases in their headline remuneration by expanding the range of expenses they were entitled to claim to an excessively generous level. Over the past few months, the platinum-plated system of expenses and allowances was found to be wholly out of touch with what was available in their jobs by ordinary voters still lucky enough to be in employment. It seems clear that the expenses office saw its duty as to facilitate the claiming of expenses properly payable within the rules as they stood. This appears to have included second home allowances of around £22k a year, food allowance of £400 a month and sundry expenses incurred whilst in office, including cash drawings of several hundred pounds a month unsupported by receipts. The "flipping" of the status of properties to ensure that capital gains tax was rarely paid on the sale of residences was also within the rules. The odd MP is alleged to have overstepped even a generous system by claiming for non-existent mortgages and such-like. The difference between this and what would be fraud in the real world escapes me. Although it appears hardly any of the claims were unlawful, it appalled most electors as wildly over-generous, particularly when it appeared to fuel the greed of some and prompt forays into regular property dealing, funded by the allowances and enhanced by favourable tax treatment. and finally, the piecemeal approach of party leaders in disciplining those who have made improper claims. It does them no credit. Certain MPs appear to have have been singled out for discipline or deselection whilst others - usually in very high office or senior figures in their party - have escaped any censure. It is a pathetic footnote to a shabby interlude in our political history. Very many of our MPs have been exposed to be hypocritical. A good number of them boast of a vocation in public life founded on an altruistic desire to work for the benefit of their fellow men and improve society. This scandal has removed any vestige of credibility that there might have been in many such claims. Given that our nation's problems now seem so very daunting, the confirmation that many of our representatives and legislators are opportunists and charlatans on-the-make is truly chilling.